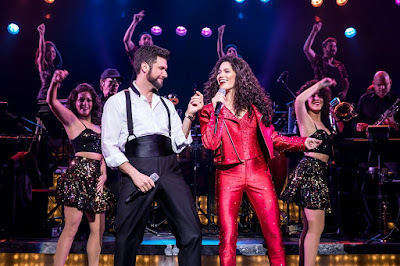 Review: ON YOUR FEET! Will Have You On Your Feet! Those of us who lived in Miami in the 1980s know firsthand the phenomenal rise of Gloria Estefan and the Miami Sound Machine. 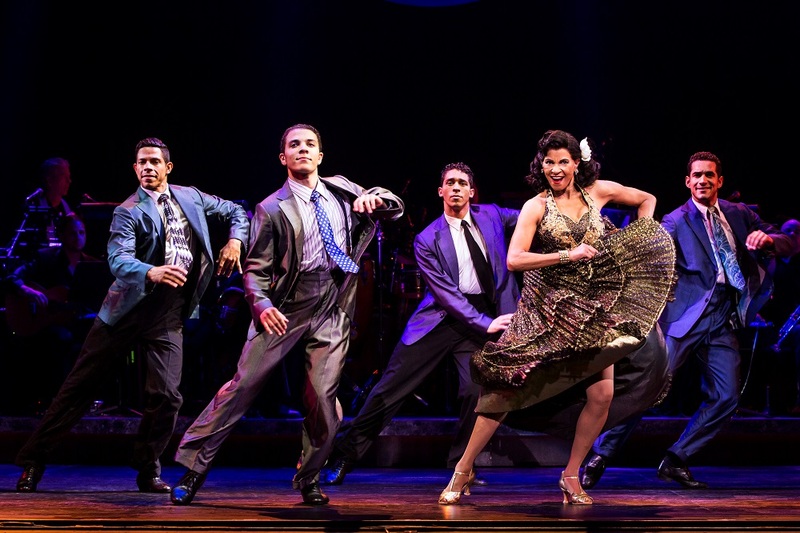 They were already hometown favorites prior to the release of “Conga” but, when that song hit, it changed everything. You couldn’t go to a club on South Beach or turn on a local radio station without hearing the upbeat dance song, and you couldn’t stay in your seat once it started playing. It was a joyful dance call to action, a rousing anthem to get up and get out on the dance floor regardless of age, ethnicity, or ideology. Those opening three notes – D D# E minor – had power, and it was impossible to resist them. You could “name that tune” (as the old ‘70s TV show challenged) in only three notes, two if you were paying attention, but their record label wouldn’t even produce it because the lyrics were in English. 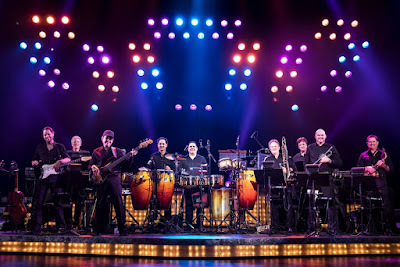 They were already stars in the Latin music world but, in typically shortsighted fashion, their producer scoffed at the group’s desire to crossover into American pop music. Still, Emilio Estefan knew it was a hit and in a quintessential grass roots campaign, he took the song to every public party and outing possible to prove it. 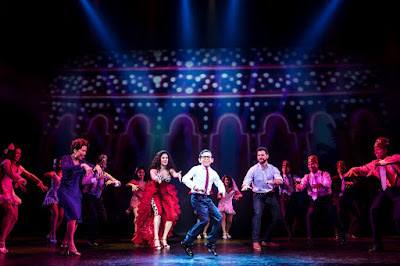 The milestone is captured in the Act I finale of On Your Feet!, a vivacious bio-musical based on the lives of Emilio and Gloria Estefan, in a montage that shows them performing “Conga” at a Bar Mitzvah, an Italian wedding, and a Shriner’s convention before Phil (Devon Goffman), their producer, finally sees the song’s wide appeal. 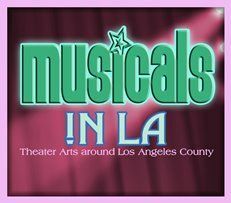 The scene closes on a high note as the actors’ conga line spills down into the aisles from the stage of the Hollywood Pantages Theatre, where the touring production is currently playing, picking up audience members as it dances its way to the lobby with a 1-2-3-kick. 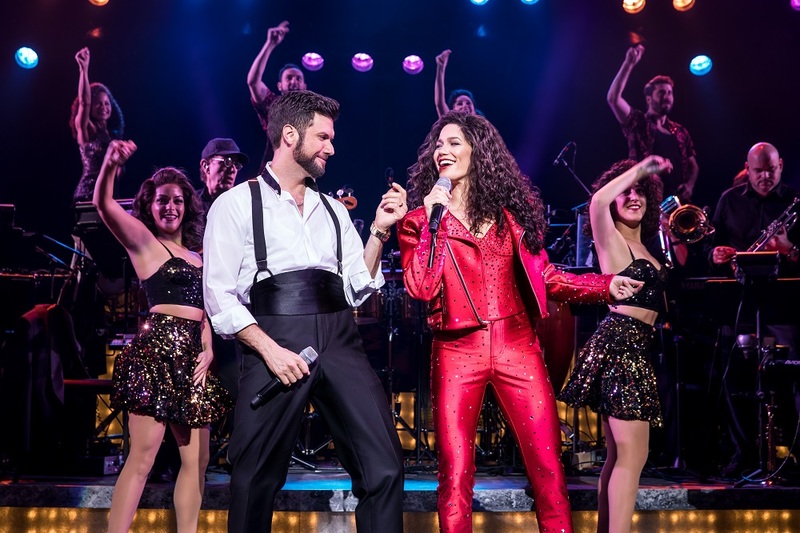 The Estefans’ story is a natural fit for the jukebox musical format and is packed to the brim with chart-topping hits like “Turn the Beat Around,” “1-2-3,” “Rhythm Is Gonna Get You,” and “Get On Your Feet,” the song that inspired the show. 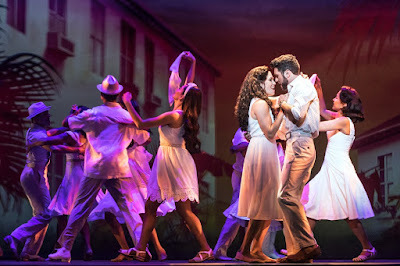 It follows both their professional and personal life, from Cuba to Miami and the early days of Emilio’s Miami Latin Boys, to their slow burn of a romance which took two years to finally ignite. 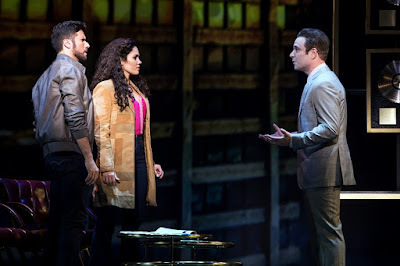 Conflict comes from within Gloria’s own family as her mother Gloria Fajardo (Nancy Ticotin) remains the lone holdout against her daughter pursuing a career in music. As a young girl, she too had dreams of being a singer but when her father refused to let her sign a contract to become the Spanish voice of Shirley Temple, she was devastated. 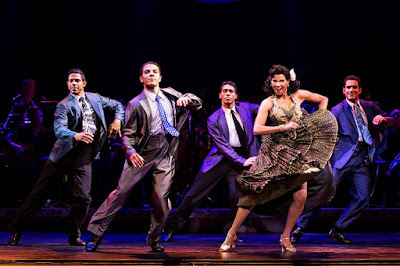 We see, in a flashback to her last club performance in Havana, that her mother was a talented singer who would quite possibly have become a star in her own right, had it not been for the Cuban revolution. 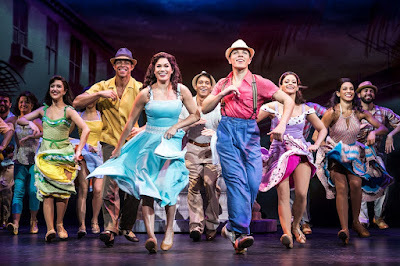 But, when Castro seized power, her husband saw to it that she, little Gloria, and Gloria’s grandmother Consuelo (Debra Cardona) were able to escape the country, even though he could not leave, and her dreams as an artist came to an end. 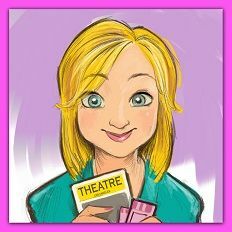 Ticotin transfers all her fire and passion into the role displaying a spicy temperament grounded as much in a mother’s fierce love as it is in a lingering unhappiness at the opportunities denied her. As Gloria, Broadway understudy Christie Prades lights up the stage. She isn’t a sound-alike for the iconic singer but there are moments when you’d swear she’s the real thing. Her endless energy and natural innocence captures the appealing essence of the superstar making it easy to fall in love with her. Mauricio Martínez (NBC Universo’s TV series El Vato), who plays Emilio, is all charm and tenacity as he spits out the unique speech pattern of the brains behind the Estefan empire, a source of much humor in the show. Plus, the pair has the kind of chemistry that makes their long, slow attraction pay off when romance finally blossoms. Bookwriter Alexander Dinelaris (who won an Academy Award for the film Birdman, but is also credited as the writer of the less fortunate The Bodyguard Musical) necessarily shortcuts events in the interest of time, but most of the show’s best moments take place within the songs. Director Jerry Mitchell and choreographer Sergio Trujillo ratchet up the emotional impact with a cavalcade of Cuban dance rhythms, festive concert performances, and heart-driven ballads that will leave you wanting more. 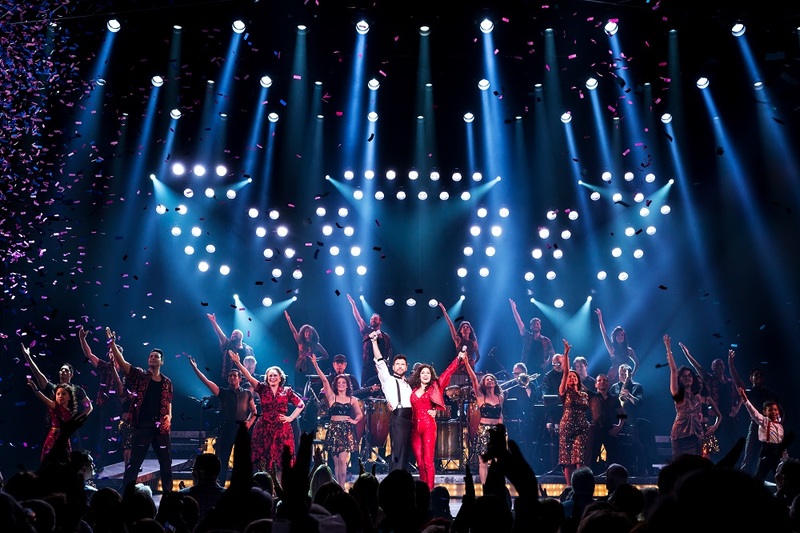 You’ll get an exciting addendum in the encore medley of songs at the end of the end of the show that includes reprises of several upbeat numbers plus “Turn the Beat Around” and “Everlasting Love” so don’t leave early. 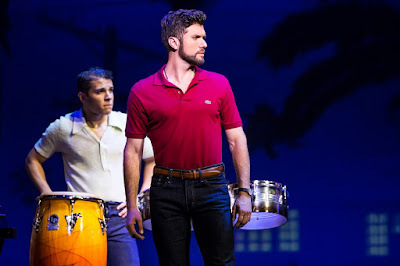 The touring design is awash in the colors of Cuba and Miami Vice pastels, making it as visually stimulating as is the sound of the music (costume design by Emilio Sosa, scenic design by David Rockwell, lighting design by Kenneth Posner). 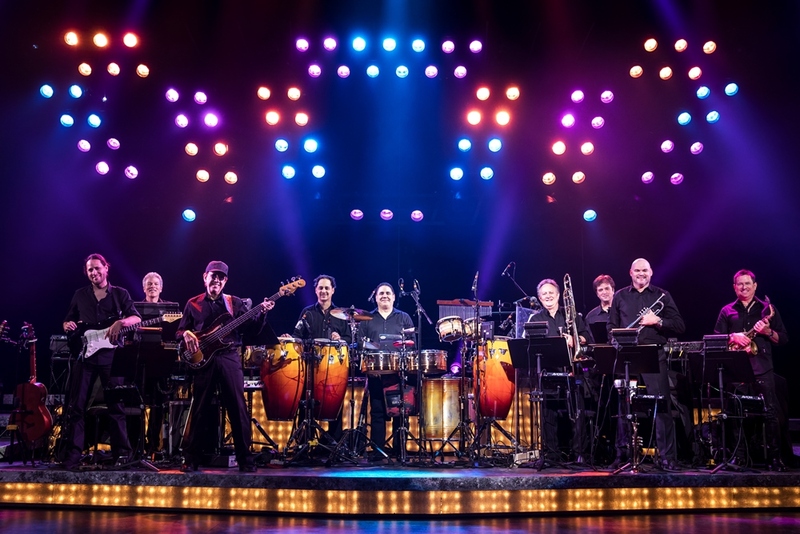 And happily, the fantastic orchestra includes five members of the Miami Sound Machine, including musical director Clay Ostwald. They open the show so don’t be late. It’s quite a moment and you don’t want to miss it. If ever there was a story that epitomizes the fulfillment of the American Dream through hard work, dedication, and sheer determination, it is On Your Feet! 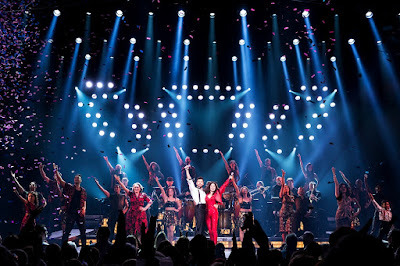 I’ll never forget seeing Gloria Estefan on her concert tour after the accident. The titanium rods implanted in her back had given her the support to heal and left her with ramrod straight posture. They swung her out over the audience on a lift and we were dumbstruck by how effortless she made it look, even after all she’d been through. What a gloriously inspiring way to leave a legacy. 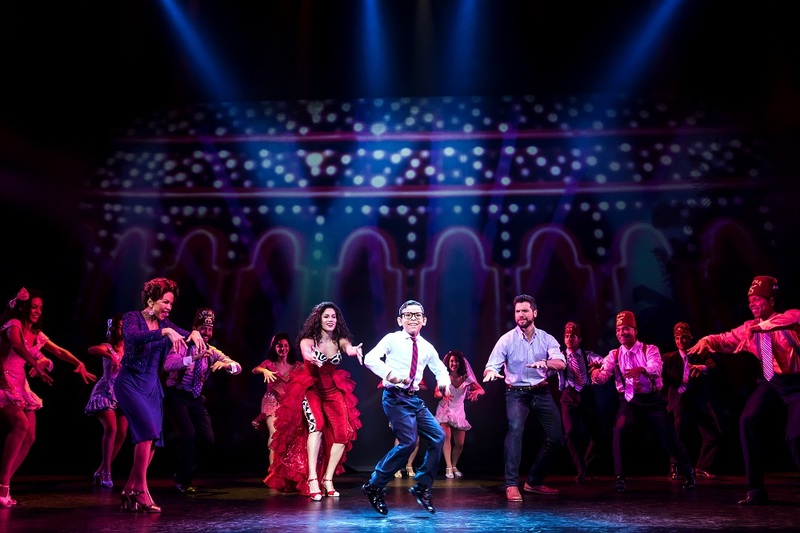 The company of the national tour of On Your Feet!